Yesterday, footballing super-power Argentina was reduced to a crumbling mess after Croatia humbled Lionel Messi and co with a resounding 3-0 defeat. The defeat was so embarrassing that an Argentinian TV show held a one-minute silence, the kind which you would normally reserve for a national tragedy. The pasting the Croatians handed La Albiceleste was so devastating the presenters on Argentinian TV channel TyC Sports felt it warranted such a ridiculous ‘tribute’ of sorts. For those who don’t have an interest in football, they will probably view this as a ridiculous gesture, others will probably have a sense of schadenfreude (presumably the English and Brazilians). Though it’s still possible for Argentina to qualify for the knockout stage, yesterday’s loss and a 1-1 draw against Iceland has put them in a tough position. Judging by the reactions of the TyC Sports they’re not exactly looking at the glass half-full here. You could argue it’s overreaction to the terrible result, but you deny it’s funny how their TV studio resembles something akin to a funeral service or wake. However the sombre expression on the faces of the presenters couldn’t mask the rye smiles either – a few were even struggling to keep a straight face. They knew how ridiculous their gesture was, despite the manner of the national team’s defeat. In order for Messi and Argentina to reach the knockout stages, they’ll need Nigeria to beat Iceland today (or draw) and hope they can beat Nigeria (by a significant goal difference) and hope Iceland lose to Croatia in their final group game. In the post-match conference Argentina’s head coach, Jorge Sampaoli, faced a grilling from the press, the likes only reserved for managers who have truly screwed the pooch (I’m looking at you, Roy Hodgson). According to BBC Sport, the opening question from reporters claimed ’40m Argentines hold you responsible for selecting Caballero’. 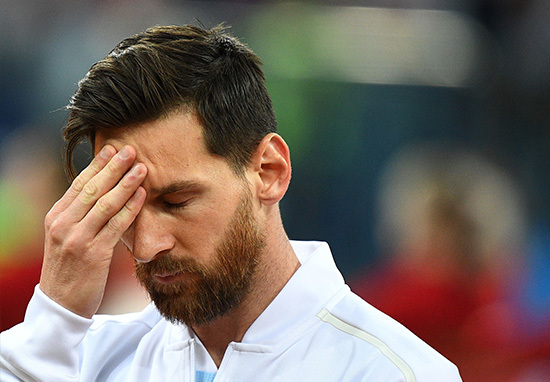 Another Argentine reporter wanted to ‘… talk about shame and embarrassment’, while another asked him ‘Why can’t you get your players to pass the ball to Lionel Messi?’. Wow, with these kinds of questions you’d think he’d pushed an old lady down ten flights of stairs and stole candy from a baby. But this is football and as much as I love the beautiful game it can be very fickle. One minute they love you, the next minute they’re hanging you from the proverbial gallows.